On Friday, December 7, please join us for a reception for Face to Face – Portraits by Joseph Delaney. This exhibition features many of Joe’s sketched portraits from the Ewing Gallery Permanent Collection. 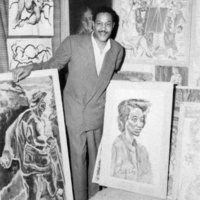 Joe was a prolific sketcher, and often drew people on the street In the Washington Square Park in New York, while he exhibited his paintings as part of the Washington Square Outdoor Art Exhibition.